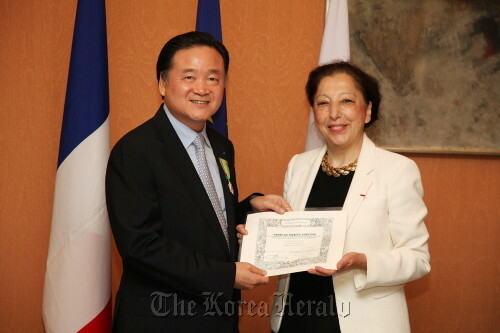 Hur Young-in, chairman of SPC Group, was conferred the Merit of Agricultural Chevalier at the French Embassy on Tuesday for promoting French food culture in Korea. The order was created in 1883 by the French minister of agriculture to honor those who greatly contribute to the development of French agriculture and food. French biochemist Louis Pasteur was the first to win the order. Hur enhanced the image of French baking in Korea through bakery brands, Paris Croissant and Paris Baguette, Ambassador Elisabeth Laurin said at the ceremony. In 2010, Hur won another order from France, the National Order of Office Merit, for pouring direct investment into French firms to increase the employment rate and trade. Ambassador Laurin pointed out in the ceremony that Hur is the only Korean to be conferred both orders. SPC Group set up business in 1945 and has entered the local bread markets in China, Vietnam and the United States. The group has developed franchises and brands including Paris Croissant, BR Korea, and Shany and Samlip General Food.